The “PBR” panel is the industry recognized “R” panel with a purlin bearing leg. The purlin bearing leg, like the “DR” panel provides for a neat, clean lap. The “PBR” panel provides a full 36 inch coverage and has a UL90 wind uplift rating. The panel is available in galvalume or painted, and is available in 24 gauge and 26 gauge. 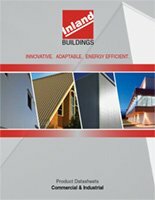 The TS-324 Standing Seam Roof System provides the maximum in performance, reliability and cost efficiency. TS-324 utilizes a proven, patented seam that provides superior wind and weather protection under all roof loading conditions. 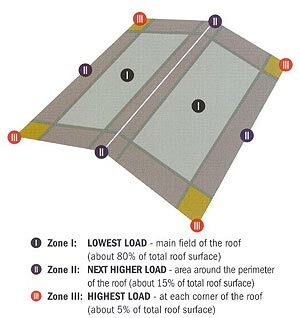 Standard industry tests on various roof configurations have shown that the wind loading on a roof fall into three zones. These range from the lowest load (approximately 80% of the roof surface) to a higher loading around the perimeter of the roof, and finally, to the highest load on the roof which is at the corners. TS-324 accommodates all three roof zones by the simple and efficient execution of one of three seaming shapes. Each seam shape is formed in the field after the roofing panels have been installed. Precise roof wind loading requirements are met with TS-324, without added roofing materials or altering panel/purlin placements, by simply selecting the appropriate seaming method to meet the uplift load for the zone. There is no need to change purlin spacing and no need for external clips over the seam. In fact, most projects can be completed with a consistent purlin spacing, one size panel and one type of clip throughout – resulting in faster erection and lower overall cost for materials and installation. There are three seaming versions of TS-324 available. The Roll-and-Lock seam is accomplished by hand seaming the seam at each clip. This seam provides superior water resistance by isolating the sealant from dislodging or separation during severe wind. The seaming step is simple as all that is required is one rotation of the hand seamer at each clip, locking the panel to the roof structure. The Triple-Lock seam is accomplished by seaming the entire seam with an electric seamer. Triple-Lock uses a 360° plus 90° seam that structurally isolates the seam from severe wind loading by a combination of design factors. The Quadri-Lock seam can be used in extremely high wind areas to provide allowable uplift loads of 64 PSF to 120 PSF. The additional strength is produced by the use of a specialized electric seamer. TS-324 panels are standard 24 gauge material and available in Galvalume® , Ceram-A-Star® 950 or Fluropon® 70% Kynar finishes. The VS-216 (VERTICAL SYSTEM) standing seam panel provides superior wind and weather protection under all roof loading conditions. The seam geometry and seaming methods virtually assure that your installed roof will perform as it was designed at minimum cost. This panel is available in Galvalume Plus and Kynar 500 finishes.